The maxillary division of the trigeminal nerve, a.k.a. 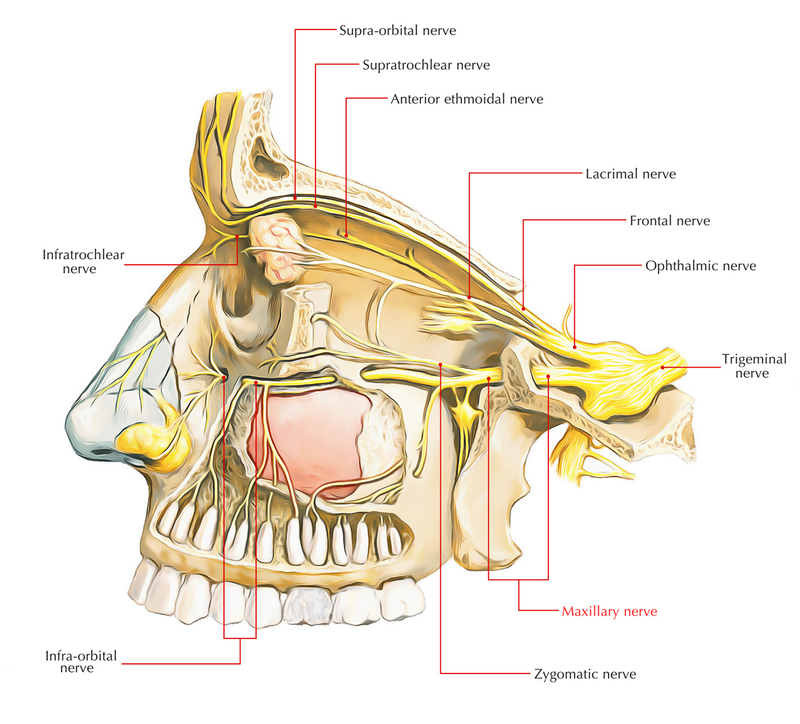 the maxillary nerve is a purely sensory nerve. It is the medium-sized branch of the trigeminal nerve in the middle of the smaller ophthalmic division as well as the biggest mandibular division. It arises from the convex anterior border of the trigeminal ganglion, pierces the trigeminal cave of dura in order to attach to the lower part of the lateral wall of the cavernous sinus. In order to reach the pterygopalatine fossa the nerve leaves the middle cranial fossa through foramen rotundum. It traverses straight within the upper part of the fossa and arrives in the orbit via inferior orbital fissure; therefore it is referred to as infraorbital nerve. The infraorbital nerve travels forward alongside the floor of the orbit within the infraorbital groove and canal successively and via infraorbital foramen appears on the face. So in its path the maxillary nerve passes from four regions in progression: the middle cranial fossa, the pterygopalatine fossa, the orbit and the face. The dura in the middle cranial fossa. Skin covering the side of the nose. Meningeal branch supplies the dura mater of the middle cranial fossa. 1. Ganglionic (communicating) branches, two in number in the direction of pterygopalatine ganglion. Zygomaticotemporal branch supply the skin of the temple. Zygomaticofacial branch supply the skin of the face. Posterior superior alveolar nerve supplies the mucus membrane of the maxillary air sinus. 3. Then it divides in order to create superior dental plexus that supplies the molar teeth and neighboring part of the gum. 1. Along the lateral wall of the maxillary sinus Middle superior alveolar nerve stimulates the premolar teeth. The dental branches supply the canine and incisor teeth. The nasal branches supply the mucus membrane of the lateral wall and floor of the nasal cavity. Palpebral branches supply the skin of the lower eyelid. Nasal branches supply the skin of the side of nose and the movable part of the nasal septum. The maxillary nerve travels straight anteriorly from the trigeminal ganglion and often protects the parasellar and parasphenoid compartments from infratemporal exposure. In order to adequately expose nasopharyngeal and parasellar tumors, sectioning of the maxillary nerve is required. In order to mobilize the orbitomaxillary skeleton, transfacial dissection typically requires V2 division peripherally. Unilateral injury or the resection of the maxillary nerve produces midfacial and intraoral anesthesia that often recovers to some degree and that rarely produces serious sequelae. A rare but notable complication of surgery nearby towards the trigeminal nerve is postoperative neuralgia.